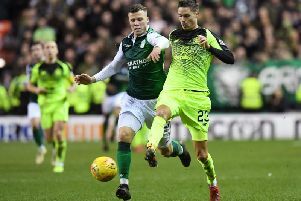 The pitch invasion which followed Hibs’ historic Scottish Cup triumph was caused by no more than the “exceptionally high degree of excitement” amongst fans, a report into the events at Hampden on May 21 has concluded. Sheriff Principal Edward Bowen QC, who conducted the inquiry, ruled that the vast majority of supporters who ran on to the pitch did so in a spirit of jubilation – but about 200 behaved in a manner which went well beyond “a manifestation of high spirits”. While clubs, police and stewards are cleared of blame, his report does say politicians should consider making pitch invasions a criminal offence in Scotland following the chaos. Mr Bowen also recommended a raft of security upgrades at the national stadium, after ruling that pitch invasions at Hampden may be “easier than it would be at other football grounds”. He also said that consideration should be made to having a police reserve for rapid deployment across the halfway line at the first sign of a pitch invasion. Mr Bowen said Rangers “merited greater police attention” than Hibs fans during the match itself, due to “the discharge of pyrotechnics and the singing of sectarian songs”. Chaotic scenes unfolded at the Hibs end after captain David Gray’s injury-time goal won the match and made history for the Easter Road side. Gray and three other Hibs players rushed towards the stand and interacted with fans. Two Hibs fans vaulted the wall and were detained by police, but within ten seconds of the final whistle hoards of Hibs fans invaded the pitch. Some Rangers fans subsequently ran on to the pitch and “a series of scuffles took place”. Mr Bowen said he was satisfied both clubs and the Scottish Football Association took reasonable precautions to minimise the possibility of a pitch invasion. He concluded there was no evidence to suggest the pitch invasion was planned, that the Hibs support had not been infiltrated by individuals holding some form of malicious intent, and that while some supporters were affected by alcohol, both male and female, that hadn’t played a significant part in what happened. SFA compliance officer Tony McGlennan will now launch his own investigation into the pitch invasion before a decision is taken on what sanctions, if any, will fall on the clubs. SFA chief executive Stewart Regan said: “The Scottish FA is grateful to Sheriff Principal Bowen for producing such a comprehensive independent review of the circumstances immediately following the William Hill Scottish Cup final.